Citi has made bi inclusion a priority for their LGBT+ strategy. Working closely with the LGBT network group, Citi has ensured that all of its policies are inclusive of bi employees and explicitly define and prevent biphobic bullying and harassment. 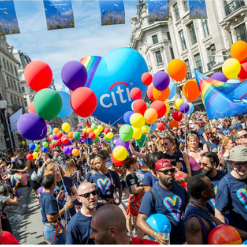 Citi has given visibility to its bi employees, including people of faith and people of colour. In 2018, their Pride Network London co-chair and Bi Role Model of the Year, Clare Eastburn, was featured on their global social media channels and Citi website. The network has a bi rep who runs internal awareness sessions about bi identities and issues, including bi erasure within the LGBT community. The network also celebrates Bi Visibility Day and communicates to the whole organisation about this work. Senior bi staff members also speak at a range of external events.